The railway station is one of England’s most distinctive and best-loved building-types. Yet over the past century the nation’s stations have often been overlooked or dismissed, and have suffered accordingly. Today a new interest in railways – fuelled by the need for sustainability, by a growing awareness of the realities of transport economics and by the dedication of enthusiastic volunteers at heritage railways across the country – has sparked a renaissance for the historic railway station and a new appreciation of the aesthetic virtues and regeneration potential of imaginative station architecture. The English Railway Station is an accessible, engaging and comprehensively illustrated general history of the architectural development and social history of the British railway station, from the dawn of the Railway Age to the ravages of the 1960s and the station’s rebirth at the end of the 20th century. It traces how the station evolved into a recognisable building type, examines the great cathedrals and the evocative country stations of the Victorian era, and looks at how the railway station has, over the last fifty years, regained its place at the heart of our communities. Steven Parissien is Director of Compton Verney in Warwickshire. ... altogether an invaluable record of the impact and aftermath of the Victorian Railway Revolution and its importance in our ever fascinating and treasured heritage. 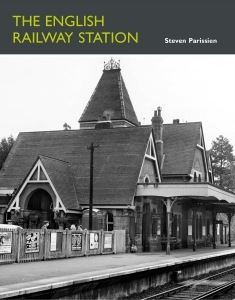 ... a new survey from English Heritage, 'The English Railway Station', written by the historian and scholar of stations Steven Parrisien, which informatively recounts their rise and fall. Packed full of facts, the author considers the wider role of station buildings to include people, hotels, vehicles and animals. You don't need to be a railway buff or an architect to enjoy this splendid book, just a liking for a touch of historical social nostalgia will do fine.